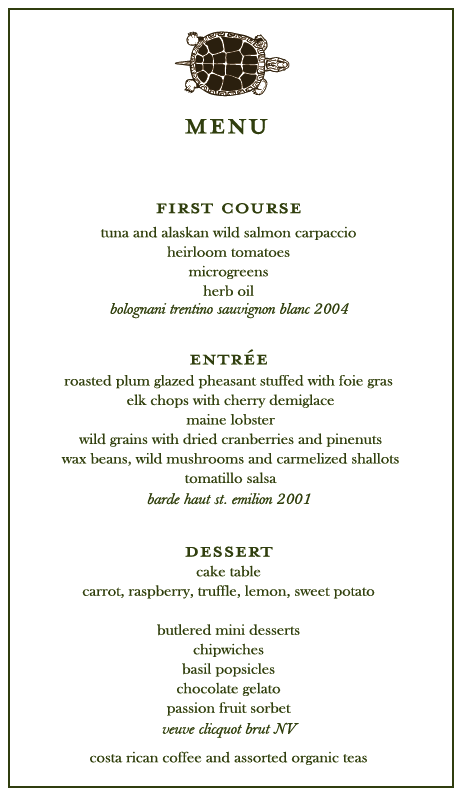 This menu dates back a couple of years to a beautiful outdoor wedding at a nearby farm. Everything about the day was simple and natural, from the earthy letterpress invitations and day of items, to the healthy and seemingly delicious late summer menu. Caterer Peter Callahan, a favorite of Martha Stewart Weddings, matched the feel of the evening with this amazing combination of tastes, but admittedly what has my eye here are the sweet endings. Because the celebration continued into the wee hours, there were plenty of butlered treats to go around long after dinner had been served. I love the idea of these one-bite desserts that allow for a little sample of everything during late-night breaks from the dance floor! This one comes from our friend Kate at minted.com. An early Louella order, we were extremely flattered that she chose us for her wedding suite, and loved her idea of incorporating our wave note card design into her engraved invitations and day of items. Kate and Adam’s wedding on the California bluffs sounded amazing, and so did her menu. The bookends of this meal are what got me, starting things off with a bit of lobster and avocado and finishing with an assortment extremely enticing desserts. Last but definitely not least, this Florida wedding grabbed me from the get-go with their first course; the blue cheese and spiced pecan beggars purse. 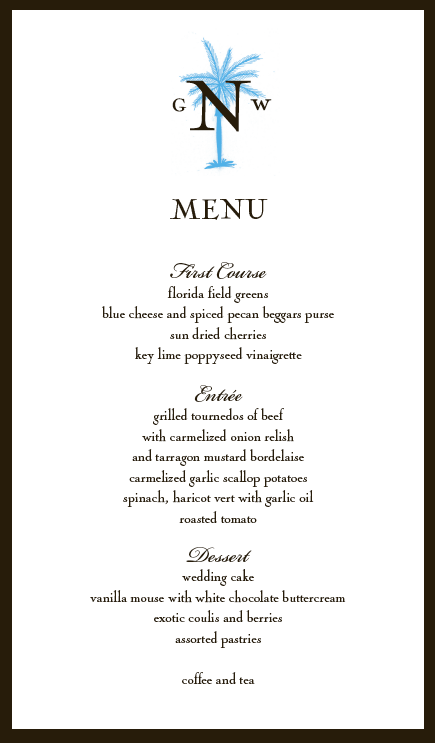 I like that the menu, by the Ritz-Carlton in Naples, adds a few twists on the traditional wedding meal. The first course is a perfect example, and so are the entreé sides… Just a bit of a twist on the foods most of us know and love. And to top off the beach inspired wedding, a light vanilla mouse- perfect! This entry was posted on July 21, 2008 at 7:50 pm and is filed under Mmmmm....	You can follow any responses to this entry through the RSS 2.0 feed. You can leave a response, or trackback from your own site.